UPDATE: For a step-by-step photo tutorial on how to make marshmallows, click this link to my Marshmallows 101 post. If you’ve got a candy thermometer, a mixer and a high tolerance for being covered in powdered sugar, you can get really good at making Peppermint Marshmallows. Making marshmallows isn’t much more complicated than making mac-and-cheese from the blue box. You heat sugar, corn syrup and water until it reaches 240 degrees F, slowly pour it into the bowl of your mixer (where you’ve already placed gelatin and a little water), and mix it for five minutes. Add your peppermint flavoring, and scrape the mixture into a pan, where it will set up overnight. The next day, you can cut the marshmallows into squares or have more fun with them: use cookie cutters. Why settle for the same-old when you could have vanilla snowflakes and peppermint Christmas trees? Plus, customized marshmallows come in handy when you need inexpensive gifts for family, friends and that person who bought you a gift when you didn’t buy them a gift. Because everyone can use a marshmallow. 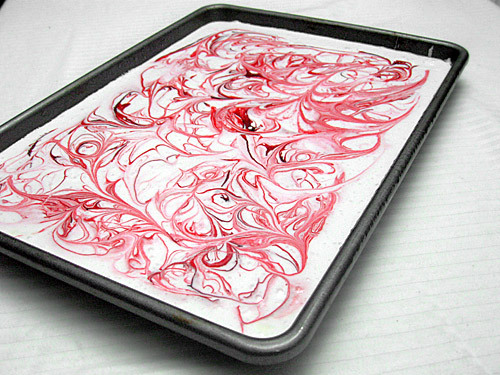 Line a baking sheet with parchment or wax paper, and coat lightly with vegetable oil spray. Set aside. Combine gelatin and 6 tablespoons of water in a mixing bowl. Place bowl on a mixer fitted with a whisk attachment. In a medium saucepan, combine sugar, corn syrup, and ¼ cup water; mix until there are no dry spots, and use a pastry brush to push down any sugar crystals from the sides of the pan. Clip your candy thermometer to the side of the pan, and cook the mixture over high heat until it registers 240 degrees F. Remove from heat immediately. With the mixer running on medium speed, slowly pour the hot sugar down the side of the bowl. Add the salt. Increase the speed to medium high, and beat for 5 minutes or until the mixture springs back from the sides of the bowl but is still warm to the touch. Add the peppermint and vanilla; beat briefly. Scrape the marshmallow onto the prepared pan, spray the top with vegetable oil, and cover with an additional sheet of parchment or wax paper. With another pan, or a rolling pin, gently flatten the marshmallow to an even 1” thickness. Use a clean pair of scissors to cut the marshmallow into 1” squares. To keep the candies from sticking together, toss them in a mixture of equal parts cornstarch and powdered sugar. Store in an airtight container until ready to eat. wow, look at those pretty swirls! is it REALLY that simple to make marshmallows? These look so cute! I love that you cut them into Christmas Trees, now I know that I have to buy some cookie cutters! Check out my blog for my Sinterklaas Giveaway! Fun! This is one thing I’ve never made. I guess I’m just not smitten with marshmallow. That said, your post may motivate me to try my hand at marshmallow making. How did you do that?! I just made my first batch of marshmallows over the weekend (uh-mazing) and was trying to get create on how to jazz them up next time. Umm, look no further than EPC! So great. Thanks for the great tips. And cookie cutters? Bless you. i’ll give you a random gift for some. Can you put liquor in them? Like peppermint schnapps for cocoa? I’m serious, here. Or rumpleman’s? godiva chocolate? Bailey’s? Oh, so fun! Usually heating sugar on a stovetop doesn’t end well for me, but these are so adorable that I might just have to give myself a little pep talk and make them! The kids would love these! And we get tired of using our Christmas cookie cutters for just . . . cookies. Great idea – thanks!! Ooo, pretty swirly marshmallows – too adorable! Did you use liquid, gel, or powdered food coloring though? Jaime: YES, it’s really simple. You just want to make sure to take the sugar mixture off the heat as soon as it reaches 240 degrees F. You will be impressing your friends in no time. Dana: Marshmallows were not my thing, either, but I really love peppermint marshmallows in cocoa. They disintegrate quickly instead of just bobbing around, like little preservative buoys. My First Kitchen: Cookie cutters work beautifully, and I haven’t had a problem with any shape. You can either press the cutters into the marshmallow and then pull away the scraps, or cut the marshmallow into squares large enough to fit your cookie cutter, roll the squares in cornstarch and powdered sugar, and then cut. One way will work better for you, depending on how humid it is outside. Caitlin: I used Wilton’s no-taste red gel food coloring, but liquid coloring would definitely work. Jenn: You’re on! Yes, you could put liquor in them. Just substitute the teaspoon of peppermint for a teaspoon of whatever. Cathy: You can do this. Once the sugar starts heating, you don’t have to stir it or check its color or any of that other jazz. Just keep an eye on your candy thermometer. I can’t believe how well the marshmallow holds it shape. I’ve used a flying pig cookie cutter for marshmallows, and the pigs hold their shape better as marshmallows than cookies. Keetha: Store them in an airtight container, and they should be OK for up to 3 weeks. If they get a little stale, just zap them in the microwave for a few seconds. Another question – how long do they keep? How far in advance could I make them, especially down herah in the humid south? Those look delicious! I’ll have to give homemade marshmallows another try; my first attempt was a disaster! Love the swirls on top! I will definitely have to try making marshmallows again this year. 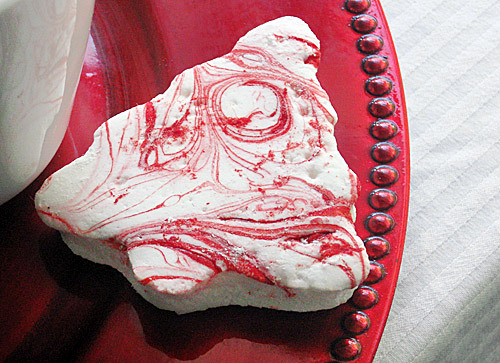 These are lovely, I was going to make some peppermint marshmallows this last weekend but time got away from me. You’ve renewed my interest! oh how cool! i have been seeing recipes for these everywhere lately. i think yours have got to be the best i’ve seen! Okay…I am so doing this…not a chocolate bit in site…until tomorrow when you will probably post the chocolate version, right? LOL. Seriously fun…the boys would enjoy these in cocoa…what fun to take to a teen party during the season, yep, so doing this one. I can’t wait to make these!!! They look so festive and fun! this looks so pretty!and no egg whites! I love making marshmallows. I’ve never made them as pretty as yours with the swirls. I’ll have to try it this year. Those turned out so cute. I love the tree shape. There aren’t any real instructions for making the swirls.. so do you just drizzle a coloring over top and swirl it with a knife? Or do you drizzle some on the fluff when it is still in the bowl and run a spatula around a little? Any suggestions for a swirl that isn’t an artificial color? I'm back at your marshmallow thread. Ha! I'm a dork. However, I'm DETERMINED to learn to make these this season. (You know me… I'm already thinking toward the holidays… yay!) So, question… Must I have one of those fancy stand-mixer things?